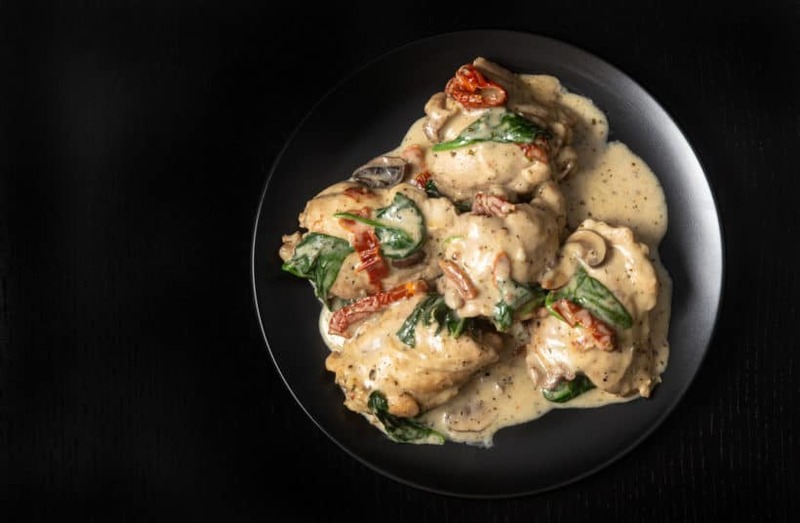 Make this Italian-inspired Creamy Instant Pot Tuscan Chicken Recipe (Pressure Cooker Tuscan Garlic Chicken). Tender chicken immersed in simple yet richly balanced creamy garlic sauce with caramelized mushrooms and sweet sun-dried tomatoes. Crazy satisfying easy weeknight meal! Incredible how only a few simple ingredients can create such balanced, well-blended & rich layers of aroma & flavors – caramelized umami mushroom meshed with a tint of sweet + slightly tart sun-dried tomatoes, balanced with all the savory chicken deliciousness. Yummy! Brown Chicken Thighs or Chicken Breasts: Heat up Instant Pot using Sauté More function. Wait until it says HOT. This prevents chicken from sticking to the pot.Pat dry chicken and season one side gently with salt + black pepper. Add in 2 tbsp (28g) unsalted butter or olive oil. Quickly add in the chicken to prevent butter from burning. While one side is browning, season the other side with more salt + black pepper. Brown first side for 3.5 minutes, then the other side for 2 minutes. Set the chicken aside. *Pro Tip: For better browning results, brown chicken in 2 batches using the same cooking times. 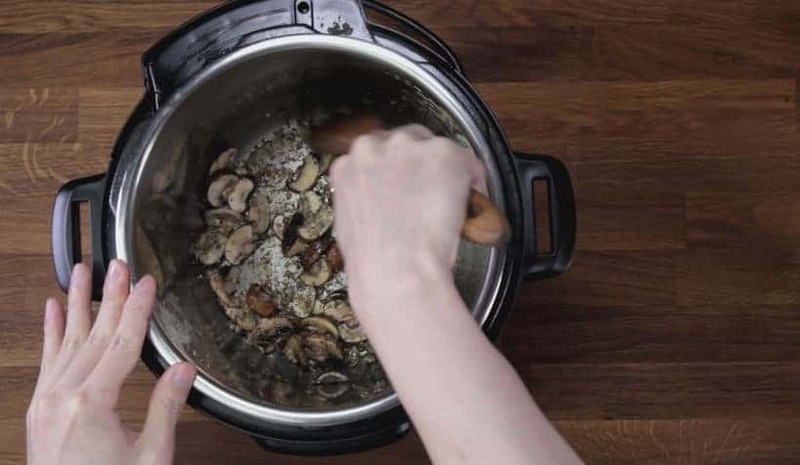 Saute Garlic & Mushrooms: Add minced garlic, then saute for 30 seconds until fragrant. Add sliced mushroom, season with salt + black pepper, then saute for a minute. Add 2 tsp (2.4g) Italian seasonings, then saute for another minute. 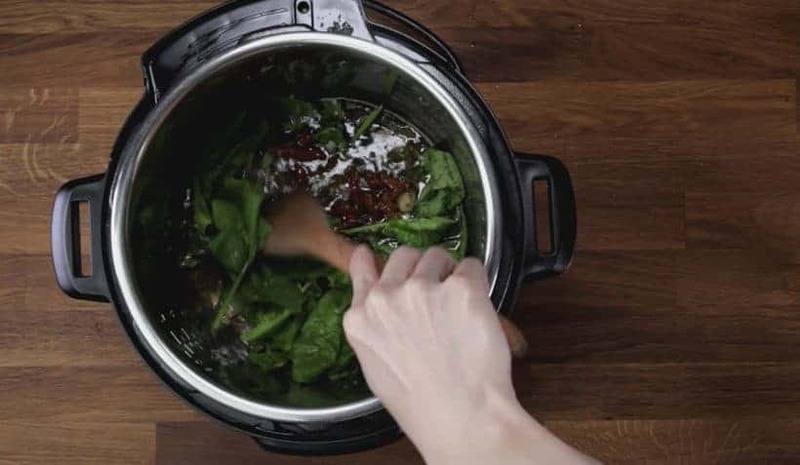 Deglaze Instant Pot: Mix 1 tbsp (15ml) soy sauce + ¾ cup (188ml) unsalted chicken stock together, then pour in Instant Pot and deglaze (scrub all the flavorful brown bits off the bottom). Give it a quick mix. 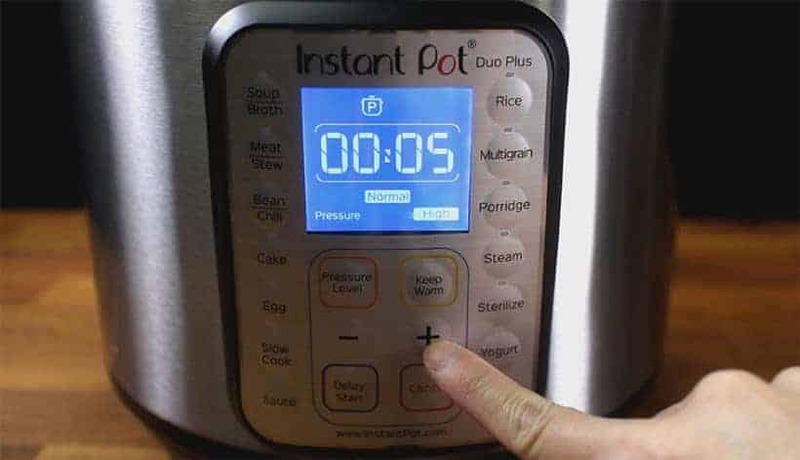 After 10 minutes, release remaining pressure. Create Tuscan Chicken Sauce: Set aside chicken, bring the liquid mixture back to a boil (Saute button). Add in 1 cup (40g) spinach and 60 - 80g sun-dried tomatoes, then cook for 30 seconds. Give them a quick stir. Mix in 1/2 cup (125ml) heavy cream and 1/4 - 1/2 cup (16 - 32g) freshly grated Parmesan cheese. Thicken Tuscan Chicken Sauce & Seasoning: Mix 3.5 tbsp (32g) cornstarch + ¼ cup (63ml) cold water together in a small mixing bowl. Add the cornstarch mixture one third at a time to thicken the Tuscan Chicken sauce until desired thickness. Taste and season with more salt, cheese, soy sauce if necessary. Serve Instant Pot Tuscan Chicken: Place chicken back in Instant Pot and give it a quick mix. 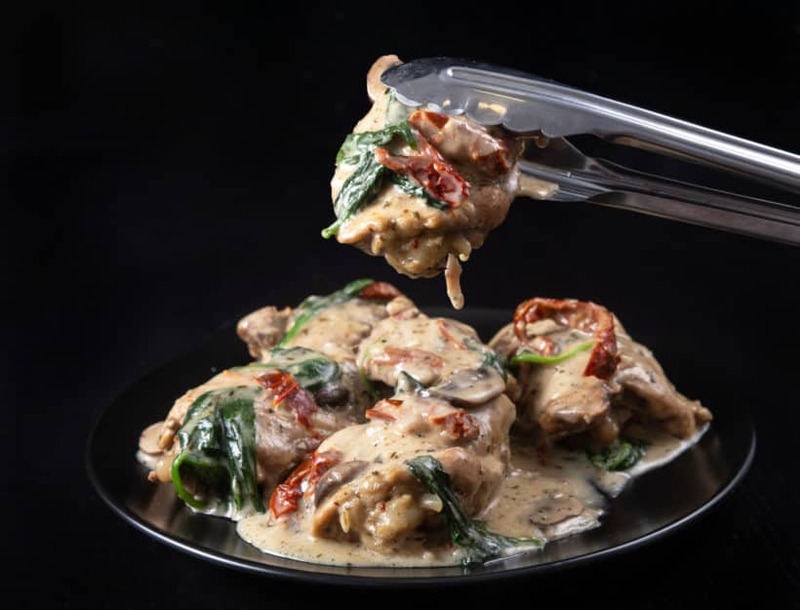 Then, serve Creamy Tuscan Garlic Chicken! 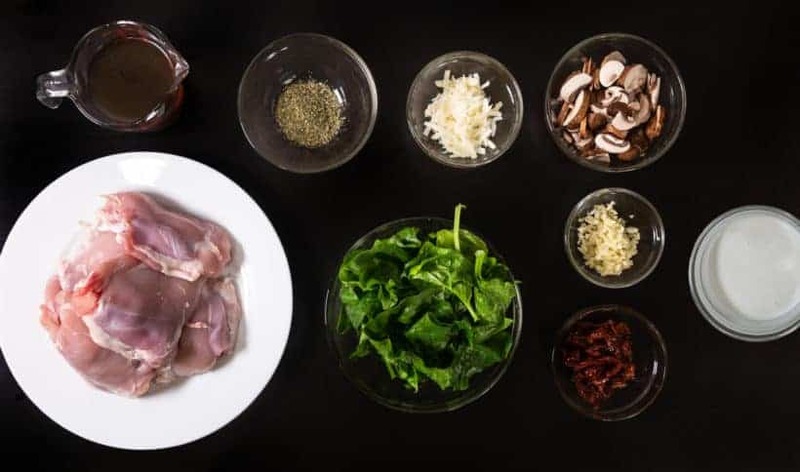 Prepare Ingredients for Instant Pot Tuscan Chicken. Wait until it says HOT (takes roughly 8 minutes). This prevents chicken from sticking to the pot. Pat dry chicken with paper towel and season one side gently with salt + black pepper. Add in 2 tbsp (28g) unsalted butter or olive oil. 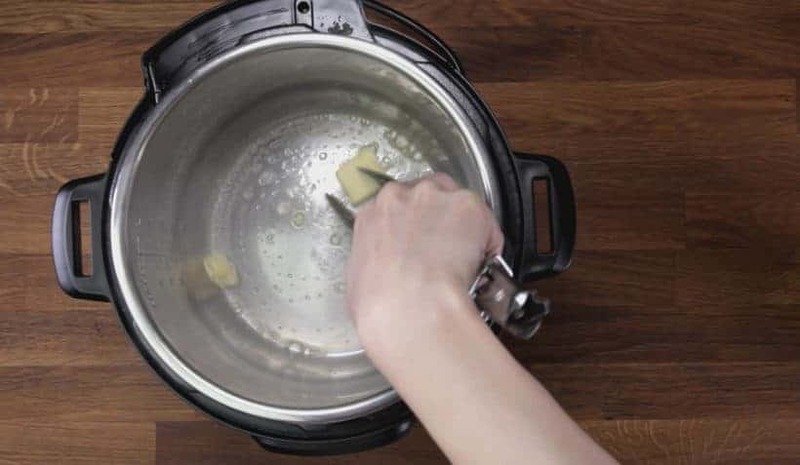 Quickly add in 4- 6 pieces of chicken thighs or breasts to prevent the butter from burning. While one side is browning, season the other side with more salt + black pepper. *Note: Since we’re developing this recipe as a quick meal, we’ll overcrowd the chicken at this step (as shown in above photo). Brown first side for 3.5 minutes, then the other side for 2 minutes. Set the chicken aside. *Pro Tip: For better browning result, you can brown them in two separate batches using the same cooking times. Add minced garlic, then saute for 30 seconds until fragrant. Add sliced mushroom, season with salt + black pepper, then saute for a minute. Add 2 tsp (2.4g) Italian seasonings, then saute for another minute. Mix 1 tbsp (15ml) light or regular soy sauce and 3/4 cup (188ml) unsalted chicken stock together. 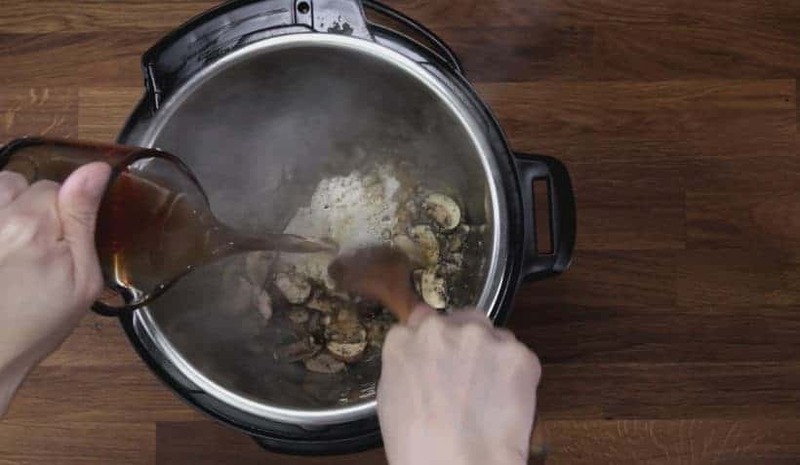 Pour the chicken stock mixture in Instant Pot and deglaze by scrubbing all the flavorful brown bits off the bottom of the pot with a wooden spoon. Give it a quick mix. 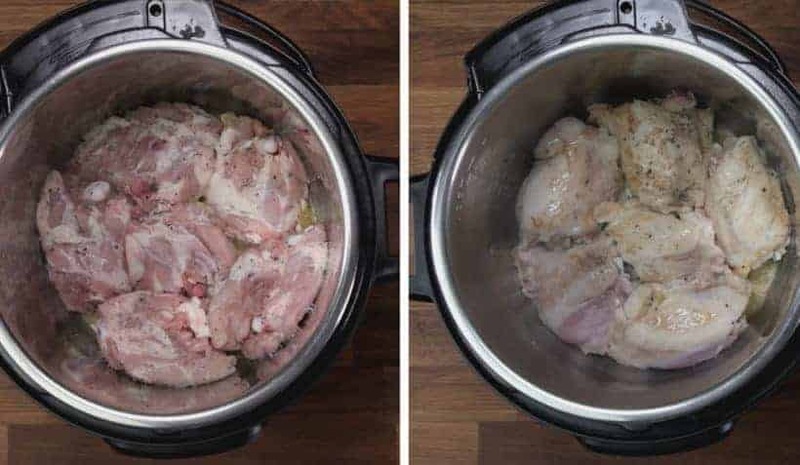 Place the browned chicken in Instant Pot. Don’t forget the meat juice! With Venting Knob at Venting Position, close the lid and turn Venting Knob to Sealing Position. After 10 minutes, release remaining pressure by turning Venting Knob to Venting Position. When Floating Valve drops, open the lid carefully. Set aside the chicken, bring the liquid mixture back to a boil using the Saute button. Add in 1 cup (40g) spinach and 60 – 80g Sun-dried tomatoes. Let them cook for 30 seconds and give them a quick stir. Mix in 1/2 cup (125ml) heavy cream and 1/4 – 1/2 cup (16 – 32g) freshly grated Parmesan cheese. Mix 3.5 tbsp (32g) cornstarch and 1/4 cup (63ml) cold water together in a small mixing bowl. Add the cornstarch mixture one third at a time to thicken the Tuscan Chicken sauce until desired thickness. Give the sauce a taste and season with more salt, cheese, soy sauce if necessary. Thank you for this fantastic recipe. We loved it! This recipe is delicious! I have made it more than once. My whole family loves it . Happy to hear your family enjoyed this! Made this last night and it was a hit with my family. 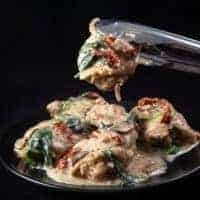 I loved it; the chicken came out so tender and flavorful and the sundried tomatoes with the garlic, heavy cream and spinach was a combination of amazing! Keeping this in my Instant Pot recipes for a dinner party I have yet to plan. My teenager went back for seconds and my baby boy took his dad’s fork from him to eat it faster! Thank you Amy + Jacky! You made a “what am I gonna do with this chicken?” night, into a “what a tasty dinner” night! Oh my, this was excellent. Easy, fast and what a taste! I will make this over and over again!!! Once again (and to no suprise) your recipe came through wonderfully. I made this for my wife and brother and served it over linguine and with Italian bread and a salad on the side. It was delicious! I’ll definitely be making this agin. By the way, I used my 8 qt. 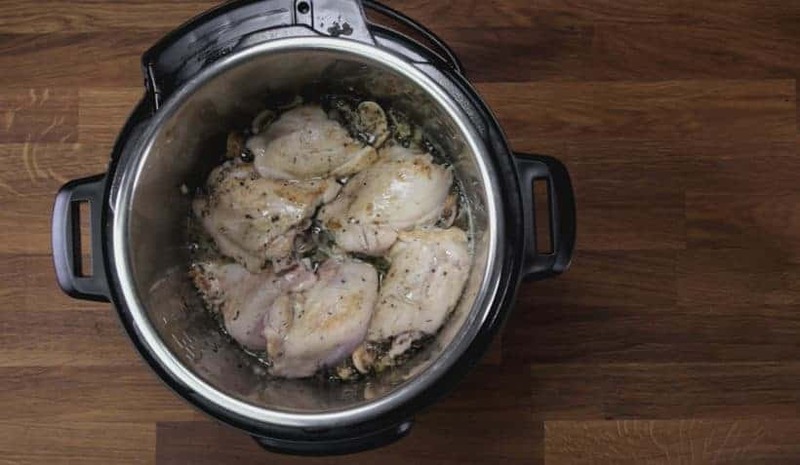 Instant Pot and a combo of breasts and thighs. We absolutely LOVE this dish. I’ve made it twice now. The only changes I made was adding 3 cups of spinach and used 3/4 cup of cream, but that was just to our taste, not because we didn’t like the original recipe. I would highly suggest making this delish dish. This looks amazing…going to make it this evening 🙂 but I want to double the recipe. Do you think I need to add any more time on cooking the chicken? (Using fresh boneless skinless chicken thighs). You will want to decrease the cooking time by a minute as the get up to pressure time will be longer. This recipe is a keeper!! I made this for dinner tonight, and my WHOLE family loved it!! Thank you! This is a great recipe! 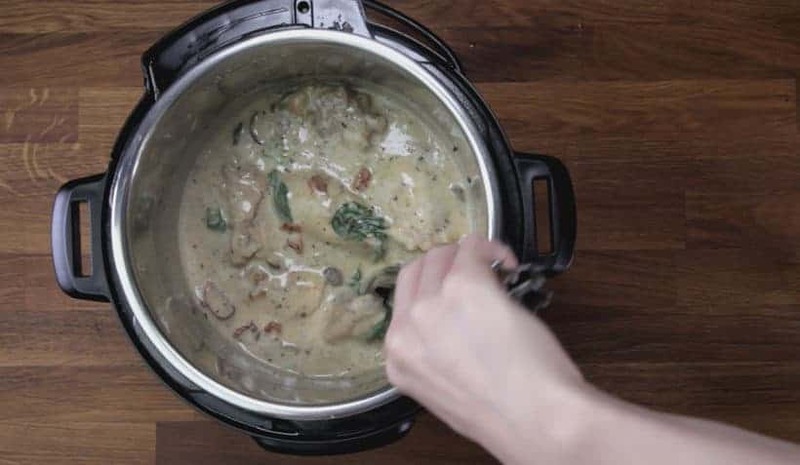 Timing and everything was spot on for creating a creamy meal and tender chicken. I am pregnant and was craving something with more robust flavors so I doubled the fresh garlic, spinach, and added both red hot chili pepper flakes(a lot) and roasted red bell peppers. Next time I think I’ll add some white onions too. Overall very pleased with this recipe though. Thank you for sharing!! Excellent! We were all happy it turned out great! Delicious! Delicious! Perfect instructions for my debut with my new appliance. What kind of Italian Seasoning do you use? Italian seasoning is mostly consisted of oregano, basil, thyme, and rosemary. Loved it! Will certainly make again! This was the third meal I made with the instant pot, still one of my favorites. Easy to make, not a lot of ingredients and it tastes so good. Even when you make a mistake it’s good. I imagine it would be good as a leftover, but it doesn’t get left over in our house. I started this recipe yesterday, and finished it today and it came out perfect! My husband, who grew up in Italy, thought it was absolutely delicious especially when we paired it with his homemade tagliatelle and a glass of Vinho Verde wine from Portugal – OMG yum! Guests be forewarned, we will be serving this a lot. Happy to hear your husband enjoyed this one as well!! My whole family loved this recipe!!!! I was delicious. I actually had to make it ahead and leave it on warm in the Instapot and it was still perfect. Fabulous! So creamy and delicious. I am absolutely going to make again! Recipe worked like a charm and was super easy. Made it for my mom for her birthday dinner and she loved it! Delicious! Better than any restaurant. This is a family favorite! We sub roasted red peppers for the sun dried tomatoes, because we prefer them. I always double the recipe to feed 6 adults and a toddler with seconds. I saw you recommended adding 2 minutes if using frozen chicken thighs, would you recommend the same for frozen breasts? 1 or 2 minutes will work fine. I made this for Valentine’s Day and it was delicious. I’m new to Instant Pot cooking so this was my first success. Do you have a recipe for including pasta with the chicken? 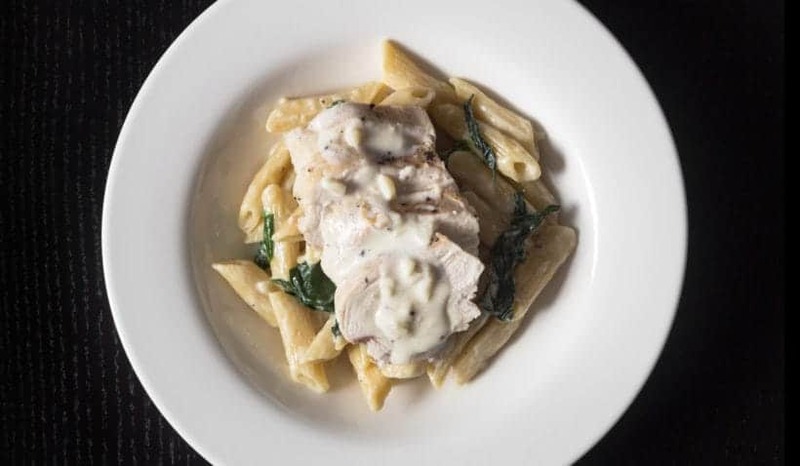 A restaurant chain called Macaroni Grill has a Pasta Milano dish containing chicken, pasta, spinach, and sun dried tomatoes. The sauce in your dish is similar to theirs. How can I include pasta in your dish? or you can use this recipe as a reference. The chicken is skinless and bone-in. You will want to reduce the cooking time by a minute for boneless chicken thighs. I could not use the soy sauce because of a gluten free family member. I substituted red wine, and had to add a little sugar at the end to round out the flavor. Next time, I would use a sweet Marsala wine instead. The chicken was delicious and really tender. The sauce was creamy and flavorful. I served it over jasmine rice with a side of broccoli. I would definitely make this again. omg! Amazing recipe it’s become one of my family favorite! I made this and it was soooooo good! I want to make it for a group now. Could I double it? I recommend reducing the cooking time by a minute as the get up to pressure time will be longer. Awesome recipe! I really appreciate the detail you give in your recipes. Really gives me a lot of confidence when trying them! Delicious – my entire family loved it! Recipe was amazing! Would highly recommend!! I browned mine in the oven afterward with a little extra cheese on top. Shredded Asiago! Yummmmmm!! This is the 1st dish I’ve tried from your site and it was soooo delicious! My picky kids loved every morsel and as you said it looks so fancy! I can’t wait to make it for guests. Can you use a lower fat milk in the sauce? I keep cans of coconut milk in the fridge and used the top cream part instead of heavy cream. I used portabello mushrooms because I did not have cremini and kale because I did not have spinach. It was still absolutely delicious. I LOVE your recipes!!! If I make this with just two chicken breasts, or maybe three, do I cut down the amount of liquid that goes in the dish? I’m happy with it being super saucy since I plan to serve it over pasta. Thank you for your question. The liquid will stay the same for this recipe. Made this tonight. It was a big hit! Couple of issues. Used chicken breasts which were a bit dry. Sauce was too thick. Flavor was awesome, though! I’m going to try the thighs next time and skip the cornstarch. I don’t think it was needed. Great recipe! I am an Instant Pot newbie and this was the first recipe I tried. It was fabulous! I will definitely make it again. As a beginner, I really appreciated the step by step instructions. Thanks! Excellent! I’ve had my ip for about five days, have made every dinner in it since I received. Three of your recipes so far, they are all awesome! Going to review the others now! Can you substitute liquid aminos for light soy sauce? I have to be gluten-free and was wondering if this would be a good substitute or do you have any other ideas? So happy to hear from you again. Hope you had a wonderful Christmas and new year holiday! Yes, coconut aminos will work just fine. I followed the directions exactly. Used chicken thighs, 5 minutes on manual followed by 10 minutes natural release. My chicken tasted great but it was overdone. Thank you for your feedback on the recipe. Perhaps your chicken thighs have a lot of moisture inside which will prolong the get up to pressure time. I recommend reducing the pressure cooking time by a minute and see how it goes. I made this for dinner last night–delicious! I left out the mushrooms, but added sliced onions. Also, since I left it in KEEP WARM mode for a couple hours, the sauce thickened up by itself. Before serving, I stirred in some prepared farafelle. It was a winner! Made this for dinner tonight. Followed instructions exactly as written except I had no sun dried tomatoes. Was still really good without them. I used chicken breasts and they were cooked perfectly! Served them with spinach ravioli. The sauce was so tasty with them. Will definitely make again. Thank you! This was one of my first dinners that I cooked in my instant pot and I couldn’t be happier with the results. We often eat chicken and I was looking for something different to try for dinner. The entire family loved this meal and we will definitely be eating it again. Thank you, thank you! I made the Tuscan Chicken tonight and it was more than superb. My husband said it is the best thing he’s eaten in the instant pot, so far. Will definitely make this again. It is worthy of special dinners for company. Love all your recipes and the step-by-step instructions. Keep up the GREAT work! Another amazing recipe from you two! It turned out perfectly, although I got home from the supermarket with no sun-dried tomatoes–must have left them in the shopping cart. The only thing that would have worked as a substitute was canned tomatoes but I only had an enormous can, so I added some sliced onion with the garlic and some tomato paste at the end and it was still fabulous. Served it with mashed potatoes and it was very hard to stop eating. I used chicken breasts which I usually don’t cook with much because they’re usually dry, but not in the pressure cooker. I can’t wait to make this again WITH sun-dried tomatoes. I know they’ll make it even better. Can I use frozen chicken thighs? If so what difference would the cooking time be? Thank you for your question. I recommend adding 2 minutes to the pressure cooking time. This recipe was fantastic! Loved the step by step instructions. My husband loved it. This was delicious! My daughters and I loved it. I made a mistake when searing the first 3 chicken breasts and they where a little dry. I forgot to let my instant pot get to “hot” before I put them in the pot. I did for the last 3 and they came out tender and juicy. The first 3 where a bit dry because I had to leave them in the browning stage too long. My husband and I both loved this. Have enough left over for another meal. Served it over medium egg noodles. This was only the 2nd time I used my new instapot, and this recipe was pretty easy for a beginner. I even messed up on one of the steps and it still came out great. Creamy and delicious! To give it a real Mediterranean accent, I added capers and Kalamata olives at the end and they tasted delicious! I am pretty sure the chicken breast were already shreddable. You can use 2 forks to shred the meat and put it back into the sauce after. This was awesome. My first IP attempt! Omg! I did make some substitutions though. I used Weber grill garlic herb seasoning and guessed at the Italian seasoning with thyme, oregano and basil. I rehydrates the dried tomatoes and added them before cooking. Then I used a mix of cream cheese and skim milk for the heavy cream. Served over noodles. The chicken was amazingly tender! I wonder if a double recipe would fit in the IP? I want to serve for bunco (12 girls). Yes, you will be able to double the recipe in the 6 quart. I recommend reducing the cooking time by a minute as the getting up to pressure time will be longer. I ran out of cornstarch! Is there anything us can use in its place? You can also use flour or any thickener. This looks delicious! Can this recipe be frozen and reheated? I am preparing some “make ahead” meals for my son’s family who are expecting their 4th child soon. I think things may be a little hectic for a while and would like them to have some dinners prepared for quick meals. Thanks. Thank you for your question. This recipe will work well for freezer meal. Hi, just wondering about using frozen spinach instead of fresh. Frozen spinach will work fine. This was delicious! Chicken was tender and the sauce was superb over jasmine rice. Will make it again. Just got my IP for Christmas and this is one of the first recipes i’ve tried…….Super Delicious and family raved about it! Will definitely be making this again and again. Thanks so much for this recipe. This is, without a doubt, the BEST I-pot recipe EVER!! My husband absolutely loves this and is all-time favourite. Thank you! This was my very first instant pot recipe. Very yummy! I used about half of the cornstarch/water mix and it was a little thicker than I had intended it to be. Go easy with that mixture so you don’t over do it. I too added more spinach like other reviewers suggested and wasn’t disappointed. Fiance approved, I will definitely use this one again. Looks great! I’m dying to try it out. Could you recommend a substitute for mushrooms? I’m severely allergic. But I do like more veggies, so just wondering if there is an alternate. Thanks! You can omit the mushroom for this recipe. My first time using my Insta Pot with this recipe was an epic fail. I followed the recipe exactly and set the pressure on HIGH for 4 minutes. The total time the Insta Pot was pressuring/cooking was more like 45 minutes resulting in an LCD display that said BURN. I managed to save the chicken but the mushrooms were a total loss. Any idea of what went wrong? Thank you! Hope you had a wonderful Christmas Holiday. It sounds like the Instant Pot was not sealed properly. Make sure the venting knob is turned to the sealing position and the sealing ring is installed properly. I made the Tuscan Chicken tonight – it was DELICIOUS!!!!! I think this is the best recipe that I have made in the Instant Pot!!!!! I used skinless bone-in chicken thighs (I will use boneless next time) and they were perfectly cooked. I used 8 onces of cremini mushrooms, 1/2 cup parmesan cheese and 15% fat cooking cream (I am from Canada). Thank you so much for this recipe – outstanding! I made this Tuscany Chicken tonight. It was out of this world! I will be making this again. Thank you for such easy directions!!!!! I have tried this recipe twice now and it’s incredibly delicious. The first time I didn’t have the right mushroom (the grocery store was out) so I substituted a portabello mushroom that I chopped up. This goes into my regular meal rotation. I also doubled down on the spinach because the first batch didn’t seem like there was enough. Your website is awesome for Instant Pot recipes.I have tried quite a few of the recipes that you have posted & have been receiving your emails for quite some time now and regularly look forward to receiving them. Thank you for all your hard work. Knowing I can shop for the ingredients for 1 or 2 of your recipes makes my weekly meal planning that much easier. Made this last night and it was delicious! Used sliced chicken breast and it turned out great! Oh my gosh!! So delicious!! Thank you for a delicious recipe! Thank you too for including the amounts along with the ingredients in the direction section of the recipe. I loved not having to scroll up and down! This looks delicious! I was wondering if you useed bone-in or boneless chicken? I was thinking you used boneless because of the short cooking time. This is really good! 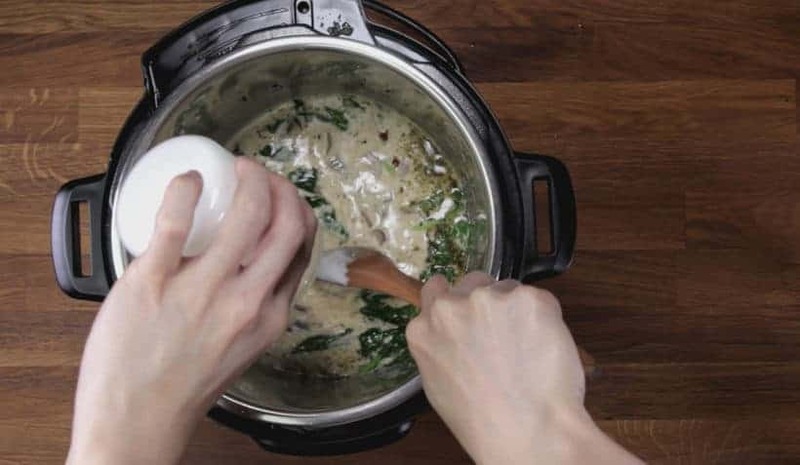 To make it even easier, try using Ultra Gel to thicken it rather than cornstarch and water–its a gluten-free, non-GMO instant thickener you can pour straight into the mixture. Produces a great, silky texture without having to boil. Available on Amazon. Happy to hear you sisters enjoyed the dish too! This is one of our favorite meals, so full of flavor. I add more spinach just so we have more vegetables. Adding more spinach is always a good and healthy choice! Amazing flavor! I will definitely be making this again soon! This is going to sound dumb, but where do you buy sun dried tomatoes? Sun dried tomatoes can be found in most larger grocery stores. I have found them in the bulk store, in oil at a Costco and if you have a grocery store with an olive cart, sometimes they are there to. I just got a dehydrator, so I am going to make my own. My family & I love this recipe but they unanimously said it needed to be served with or over noodles. If I add wide egg noodles to the pot, when and for how long would I do that? Happy to hear your family enjoy this recipe. It is best to cook the wide egg noodles separately for this recipe. Made this for dinner last night and everyone loved it! It’s now in our rotation – excellent taste and easy to make – thank you! Thank you so much for your kind words and review. Hello again guys 🙂 I’m going to try this one tomorrow. Will freshly oven roasted cherry tomatoes still match the taste profile well? I have a tonne of fresh ones, so was tempted to roast them during the beginning stages of this recipe. Can I use flour to thicken rather than cornstarch or will it take too much time to cook the taste of the flour off? Roasted cherry tomatoes will also work for this recipe. It will alter the flavor profile a little, but it will still taste good. 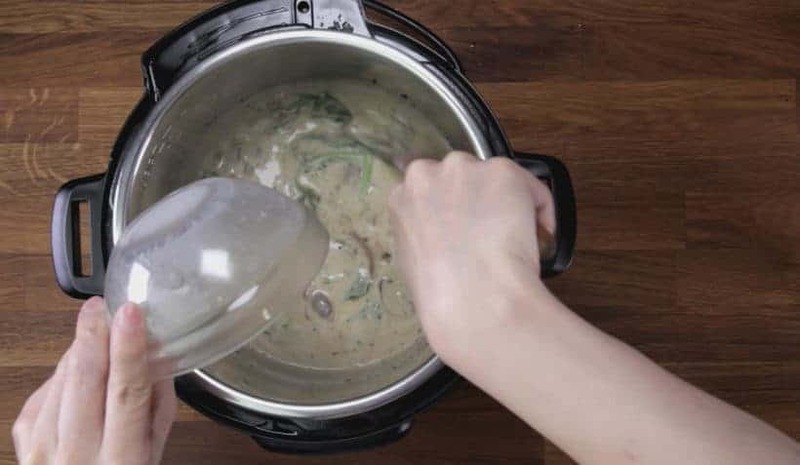 You can use flour to thicken the sauce as well! Winner, winner, (Tuscan) chicken dinner! After finishing off the Lasagne made with Umami Chili for lunch I made this for dinner tonight. Elizabeth loved it as did I. We had a package of boneless, skinless thighs and they turned out a absolutely incredible. Next time I’ll try bone-in as I know from my soup experience that bone-in adds a welcome extra bit of depth to the flavor. Now if only my Seahawks and Sounders would have won today it would have been perfect…I guess I will have to settle for perfect food. Thanks again for another incredible recipe I can add to my repertoire. I so look forward to emails introducing new recipes from the two of you. This is by far the best Instant Pot recipe site on the internet. I carry little slips with the address on them so that when I am talking to people about the site I can make sure they end up in the right place the first time. Next up for me is your Potato Soup. Thank you so much once again for your support and kind words! Please take care and let us know how the potato soup go. This is my favorite recipe so far. It was easy to make, but looks like a restaurant dinner and so delicious. I served it with polenta. Happy to hear you enjoyed it with polenta! I made this the first time it was in your blog. It makes a lot so I had two more containers in the freezer. Although I had just finished the first batch, I decided to make it again to use up spinach and sun-dried tomatoes in the refrigerator. It’s never too soon to have this as a repeat meal. It’s terrific! A little putsy when making it but it’s worth it. I used boneless chicken thighs. The only change I made was subbing out the heavy cream. The first time I used evaporated milk. Yesterday, I used cream cheese. You have the best blog out there for Instant Pot! Thank you for the Tuscan Garlic Chicken recipe. I made it exactly as posted. My husband and I loved it and thought it rivaled any fancy Italian restaurant. This is a keeper for sure. So happy to hear from you 🙂 Thank you so much for your kind words!! Happy to hear you husband also enjoyed this recipe. We loved this recipe!! The chicken was so tender, the flavor was so tasty, i think my prep time was more like 30 min though! To save some time on the prep, you can chop the ingredients while the Instant Pot is pre-heating and the chicken thighs are browning in the IP. This recipe looks AMAZING, but the Hubs can’t have cream. We are huge fans of greek yogurt, how much would you add to this recipe? I can’t wait to try this, we are having Christmas at our house for the first time this year, and it sounds like its’ going to be a perfect addition to our menu! Greek yogurt will not be as creamy, but it will work fine! I say roughly 1/3 cup – 2/3 cup, but the best way is to taste and adjust according to your preference. I tried this recipe tonight. It was amazing. Thank you for the wonderful recipe. Have fun cooking & have a lovely week ahead! My husband loves it!! He said it’s like a meal from an Italian restaurant. Ah!! Thanks for sharing! I’ll make this again!! Happy to hear your husband enjoyed it too! It turned out perfect and I’m not a good cook AT ALL! Excellent dish that has depth of flavor! I have made it twice, the first by the recipe, and the second with one modification to steps 5 and 6. I found the sauce too thin (by the recipe) so I used my stovetop for step 5, added some natural juices I took from the Instant Pot after step 4 was complete, and added the cornstarch mixture to step 6. Wow! This was great! Made mine with Skinless, boneless Thighs & it was so delicious! I love Sun dried tomatoes & Spinach with Chicken. Since there’s only 2 of us, I’m looking forward to Leftovers! Thank you! Always great to have some leftovers!! Very good!! Great recipe with amazing flavor. I added goat cheese to the top. Delish! I will say, unless you HAVE to use the instapot, it was more difficult than if I were to use a simple skillet and stockpot. I used just as many dishes with all the transferring in and out of the instapot. In the end, it was worth the effort. thank you so much for your kind words and honest feedback on the recipe. Please take care and see you around! Hi Amy and Jacky. What a great tasting recipe. My whole family loved it. The sun dried tomatoes give it a great taste and colour to the sauce. Before discovering your website I was leery cooking chicken because it would turn out dry but no more thanks to the both of you. Am I glad I discovered your website. Your instructions and photos or videos make cooking your recipes a breeze. Keep up the great recipes. Thanks for sharing. Looking forward to hearing what you make next. Made this for my family the other day and they left nothing behind. Even my wife love it. I now have your website as a favorite. Looking for a recipe for salmon. This is the salmon recipe we have. We will have more salmon recipes to come! Boneless will work just fine. It will be slightly less flavorful. I would recommend reducing the cooking time by a minute. I just bought my InstaPot, and can’t wait to try it! This recipe looks delicious and I’d like to try it out in the next few days! Have you ever tried making it with doneless thighs/breast? Boneless chicken thighs/breasts will work fine, but it will be less flavorful without the bone. I would recommend reducing a minute of cooking time for them. What would be gpod things to serve this with? Looking for any ideas. My fiance wants me to make this Friday for dinner. This dish goes well with pasta like penne or spaghetti. Have a great dinner on Friday. I really enjoy your recipes! I’d like to make the Tuscan Chicken for an upcoming dinner party. I have and 8 quart duo. If I double the recipe would it fit in the pot? Could I make it a day in advance so that I can spend time with my guests and what would be the best way to reheat it before I serve it, i.e. in the oven, or?? Do you have any special recommendations, like covering it with foil, how long to reheat it or adding extra liquid, etc. Keep you wonderful recipes coming! Doubling the recipe in the 8 quart duo will be fine. I would recommend reducing the cooking time by a minute as the get up to pressure time will be longer. The chicken will lose some of the moisture after a night in the refrigerator. 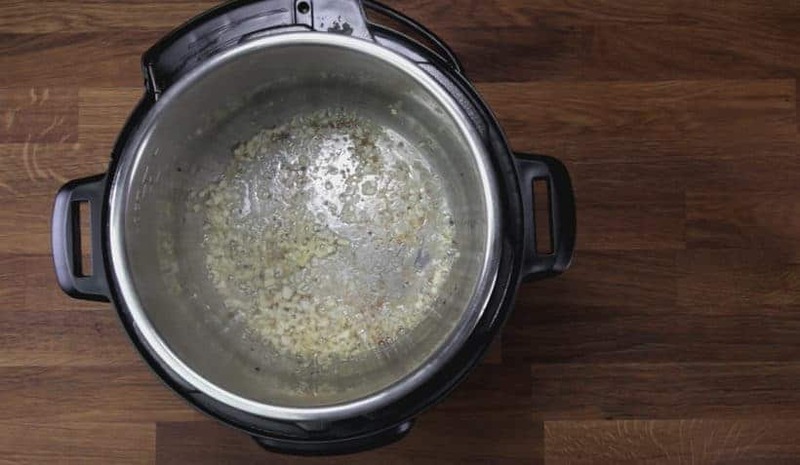 The best way to reheat this is to use the Pot in Pot method in the Instant Pot. How do I know if the pressure cooking is happening? I am in the middle of cooking it right now. It says pressure cook, high pressure, but I don’t see the timer showing four minutes, or is there a start button? It will say ON on the screen. 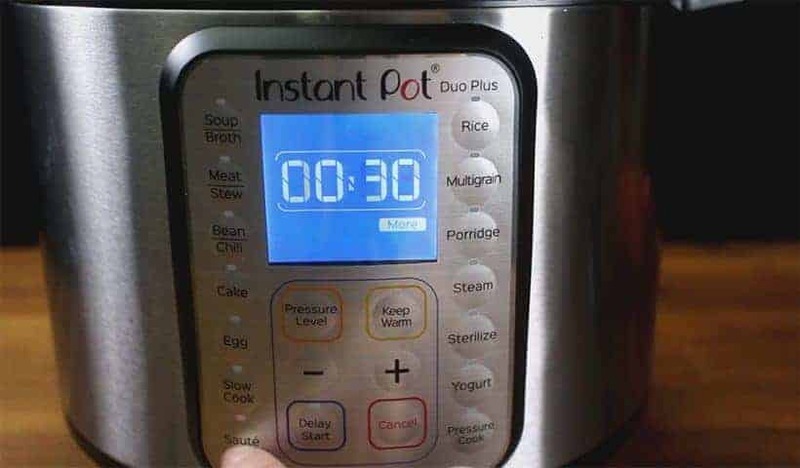 The timer will show four minutes once the Instant Pot has reached high pressure. So Good!!! Thanks so much. I didn’t have cream (used coconut milk), spinach (used rocket), fresh mushrooms (used canned) and had to stir fry some tomatoes before adding. It was so yummy. I’ll try it your way next time, but just couldn’t wait to have all the ingredients. Keep these great recipes coming!!! We enjoyed our mini Seattle trip! This looks delicious! My only hesitation at trying this is that my family and I don’t love tomatoes (it’s the texture we don’t like, not the flavor). Do you think that roasted red peppers might substitute? Or would I be better off using the sun dried tomatoes and then fishing them out? If it is the texture you don’t like, I would recommend fishing them out later as it will impart some great flavor to the dish. I would like to try the Tuscan chicken. It sounds so good. Is there something else I can replace the heavy cream with? Maybe greek yogurt? I’m on Weight Watchers and everything in this recipe works well for me except for the cream. It’s just to many points. Greek yogurt will work. Canned Coconut milk will work as well. I’m looking forward to trying this recipe for the first time in the next week! I was curious whether I should use dehydrated sun dried tomatoes or the ones that come packed in oil? Also, do you think I could sub out full fat coconut milk for the heavy cream to make it dairy free? Both kind of sun dried tomatoes will work. You can also use full fat coconut milk for this recipe. This is definitely going on my favorites board. I rarely get a thumbs up from everyone in the family, but all seven people loved it, including the kid who hates mushrooms! Thank you so much for sharing! Happy to hear your family enjoyed the recipe! Hi! I cooked this last week and it was delicious. My favourite IP recipe so far. Question, for next time I make it, is there an easy way to add pasta noodles (or even rice) to the pot so everything can cook at the same time? Ie. can I add the pasta at the same time I start pressurizing the chicken? I like the easy way of having everything in one pot and will cut any corners I can, lol. Thank you so much! The pasta noodles should be layer at the bottom of the pot and fully covered with liquid. Please see this alfredo pasta recipe for reference. I too bought this Great New Instant Pot for the first time thanks to Amazon Prime Day’s amazing deal on it and made this recipe as the first thing I tried. I’m sold! It is delicious. My daughter had seconds and is licking her plate (shh). I love the one pot meal for easy clean up too. I subscribed to your newsletter and my 16 yr old daughter remarked how she wants to learn how to make one of your recipes every week and have it ready for when I get home. What a concept! Am I lucky? What a kid! Lol. Thanks for the super recipe with easy to follow instructions on a brand new appliance I never thought I’d ever want to buy! Feel free to reach out to us if you both have any questions. Keep in touch and let us know how things go. Have fun cooking & have a blessed week! This recipe is SO good! I’ve made it once before. I’m wanting to make it again but would like extra sauce. Can I just double the chicken stock, cream, and add more spinach and mushrooms? Thanks for your help. I would recommend increasing the amount of sun dried tomatoes as well. Please taste and adjust the seasoning accordingly. Hello! Can’t wait to make this. I have a large family. What would you suggest for adjusting cooking time for additional chicken thighs? The cooking time can stay the same for additional chicken thighs. I just received my 10 in 1 Instant Pot the other day (thanks Amazon Prime Day!) and this was the first recipe I tried in it! I cannot say enough how amazing this sauce is!! I served the chicken with rotini pasta (with some of the sauce ladled on top) and asparagus on the side. My whole family thought it was just delicious! I can’t wait to try more of your recipes, but I’ll definitely be making this one again soon! Thank you for helping make my first dish in the Instant Pot so easy! Wow! This was great! Thank you as well for the great instructions. It came together really well. I look forward to trying your other recipes! Thanks!! Thanks for your lovely feedback Claire! Glad you enjoyed the Tuscan Chicken in Instant Pot. This was fantastic! I used the chicken thighs for more flavor, and more of the ingredients, for more servings. I frequent your site often for Instant Pot recipes, and have ALWAYS been pleased. Have made this 3 times already, and it always comes out great! Thanks for your lovely feedback C! 🙂 Glad you’re enjoying it! Just got an IP as a gift and this was the first recipe I tried. AMAZING! Easy to follow, tasted wonderful. Feel even more excited about this new cooking method and look forward to trying your other recipes. Thanks!!! My family was sick of chicken, but I was craving this taste. So I decided to try your recipe with pork tenderloin instead. I followed the recipe exactly, except used two tenderloins totaling about a pound and a half. I cooked 4 minutes on high pressure. The recipe was just as fantastic as ever with the pork. I served it over couscous and the teens devoured it. Thank you for sharing your cooking experience with us Elizabeth! Happy to hear it came out so well with pork tenderloin too. Yesterday I made the Teriyaki Chicken. It turned out well. Would it work just as well with the skin removed prior to pressure cooking? I removed it before baking and adding more sauce, which also worked fine. I would recommend removing the skin after pressure cooking as it will keep the meat more moist. It will work if you want to remove the skin prior as well. Your sweet replies are the reason I read comments and subscribe to your recipes. Thank you for modeling kindness for your fellow humans. Thanks for all your wonderful recipes, I’m hungrily munching my way through them. The cream sauce may separate after freezing. This will be my new chicken go-to after fried take-out! Only changes were increasing amounts for personal taste. Lots of garlic, extra cheese and garlic. Double spinach, and garlic. But the recipe is yours. We loved it and served it over egg noodles cooked in chicken broth and basil. Always a good idea to have more garlic and cheese! I made this today and my kids and husband loved it. The only thing is they did not like the sun dried tomatoes. 😔 What other different tomatoes can I use? Thank! Roasted tomatoes will be a good choice. If not, you can also de-seed Roma tomatoes and use that. Another winner! I used thinly sliced chicken breasts and cooked them in 3 batches. Left out the mushrooms and used A LOT of spinach – perfectly seasoned, creamy, yummy! Thanks for the delicious recipe Amy and Jacky! Thank you so much once again for your kind words! One of my wife’s favorite yet! I just added a lot more spinach since we both love it and it cooks down so much. Yum yum yummy! More spinach is more healthy! Another hit! This recipe is spot-on, no adjustments necessary! Entire family loved it. Keep these wonderful recipes coming, Amy & Jacky! Happy to hear the entire family enjoyed it! I usually do not write in but this recipe is outstanding. I made it last Sunday and am making it again this Sunday. Thank you so much. It means so much to us to hear your feedback! My family absolutely loved this! It’s our new favorite. I doubled the entire recipe, and added some pepperoni for some kick. Served it over bow tie pasta with cheesy garlic bread. My kids said it was the best thing I’ve made in the IP! (And I’ve made a LOT in my IP over the last 2 years.) Thank you for another great recipe! Cheesy garlic bread sounds yummy 🙂 Happy to hear your kids enjoyed it as well! Thank you for sharing this recipe. My husband is not a big chicken fan. He raved about dinner and said this is a keeper. I missed removing the chicken when you sauté the garlic and mushrooms. I cooked everything for 6 minuets instead of 4 because of high altitude. I was worried I had over cooked the chicken but it was so tender it fell apart. We are looking forward to trying more of your recipes. Another amazing Jacky and Amy recipe. I doubled all the vegetables, used skim milk, just winged part of it – ran out of arrowroot and it is thick enough. I am hearing “very good” from family coming from all over this house – it’s a busy night for people and we couldn’t sit down together! Some are saying it more than once. For the person who thought it was a lot of work – you can gather the sauce ingredients as the chicken is browning. I got it from frig to table in a little over a half hour and that included rehydrating some dried mushrooms as some of mine had gone bad. I served over couscous which I prepped while the chicken was cooking. I always have those containers of minced garlic in the freezer. Super adaptable and yummy. So good to hear from you again. How have you been? I am a new Instant Pot owner and have been trying your recipes…Fantastic! I would like to know if I can prepare some of these dishes and freeze them ahead for when my company comes. I don’t want to spend too much time in the kitchen when my company is here. Most of the dishes can be prepared ahead of time. You may want to thaw it beforehand for best result. Great dish this is! Made it last night and my husband & I loved it. Thank you Amy and Jacky! I made this tonight and served it over mashed potatoes. It was so good and so easy. My second recipe from your page. I’m in love!! Thanks for your lovely feedback BrinaB! Glad you’ve enjoyed the Tuscan chicken. Can I make this in a regular pot. Yes, this will work on the regular pot as well. You just have to create the sauce once the chicken is about 80% done. Probably the best recipe I’ve made in my Instant Pot so far! The chicken was cooked perfectly, I used bone in thighs and it turned out so flavorful. Will definitely be making this again. Thanks! Thanks for another great recipe! My hubby and I deemed this “Olive Garden-worthy!” Very easy to make and great flavor! I cut up the chicken before cooking (a little less cooking time) and served it over mini penne pasta. Delicious! We also served this over penne pasta in a family gathering! This recipe is AMAZING!!! I’ll admit, when I first decided to make this I did not notice ALL of the steps🙄. I have two little kids so a quick meal is always necessary! But, despite all the steps… It only uses the instant pot. I wandered my way thru each step and the end result was absolutely yummy!!! It was totally worth it. I will definitely be making it again! The sauce is so so good! Thanks for sharing! We understand how quick and easy meals can help young families. We hope to create more easy meals for you all <3 ! Is gluten free soy sauce ok to use as a substitute? Gluten free soy sauce or coconut amino will work fine. Ohhhhh does this look wonderful. It will be on a menu soon. 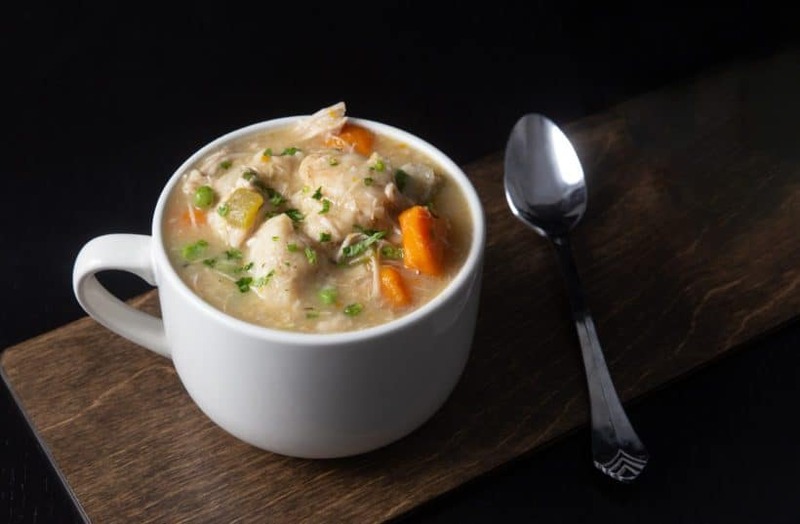 We have enjoyed all the recipes, chili and pot roast being one of our favorites, and chicken dumpling soup! Any ideas about what would be quick sides for this besides rice or noodles? The gravy is excellent over salad or mashed potatoes. I’m a new subscriber and this is the first of your recipes that I made. It came out fantastic. Very tasty! I will definitely make this again. I used boneless, skinless, chicken breasts. Your recipe didn’t mention if it was for bone-in or boneless. I used 3 breasts and kept the sauce amounts and times the same. It came out perfect (although the breasts did shrink considerably. Plenty of sauce. I think I’ll sauté some shrimp tomorrow to add to the sauce for a really quick “leftovers “ dinner. Since the dried tomatoes are only sautéed for a bit, I soaked them in hot tap water during prep and drained them before adding to the instapot. The only other change was adding some paprika at the end and garnishing with fresh chopped Italian parsley. Thanks again for the great recipe. Look forward to trying many more! Shrimps with this sauce is a great idea!! This is an amazing dish. Love the flavors. So easy to make with the instant pot, especially on days when I am really busy and have company coming over. Love your recipes. Thank you so much. I have a mushroom allergy, could I skip the mushrooms and leave everything else the same? Can I substitute the spinich for another vegetable? What would you recommend? Kale should be a good substitution for spinach. Do you ever use xanthum gum? Wonder if it could substituted? I don’t use it often, but xanthum gum can be used as substitute for cornstarch. Are the skinless chicken thighs, boneless, as well? Thanks! Can’t wait to make this. Everything I have made from your site has been delicious! Can’t wait to try this because I can already tell it’s going to be wonderful. Thanks for sharing this and all your delicious recipes as we subscribers are truly blessed by your inspirations. This looks good, but for a quick meal it sounds like a lot of work. To make it easier, The browning and sauteing steps can be skipped. It will not be as flavorful, but it will be a lot less work. My spouse is limited on his salt intake, what can I use instead of the soy sauce and can I use skim milk instead of heavy cream? Love your recipes, use them weekly. Wish we could make the recipes as directed, unfortunately my husband would become ill. I use unsalted broths and no salt canned vegetables (also fresh or frozen) in your recipes, still very delicious. You are both so creative, keep it up. I would recommend omitting the soy sauce. The sauce will be less smooth, but skim milk can be used. You can do this on the stovetop with a skillet as well. rice for lunch. I highly recommend this recipe with absolutely no changes. Thank you for posting it. If I want to half this recipe using 2 boneless chicken breasts, should I also half the sauce ingredients and will the cooking time remain the same. Thanks. I would recommend 1/4ing the liquid ingredients as 1/2 is a little low for pressure cooking. The cooking time will remain the same and please taste & adjust the seasoning accordingly. Can I substitute coconut milk for the cream? Same amount? Coconut milk will work as a substitute. The amount should be the same, but please taste and adjust accordingly. You guys “ROCK”! Next time chicken comes up on the menu, this’ll be it. Thanks so much for all your recipes. hello there, how would you adjust the cooking time for chicken drumsticks? thank you! love your recipes, and the thoughtful details you include.